I’m going to start off by saying that if you live in Calgary, you must book this place for Sunday Supper at once. I don’t think I’ve been so pleased with a meal in a long time! I say this because not only was the food mind-blowing, the price extremely reasonable, but it was so much food we had to pack some home! This is a true mark of an excellent restaurant. 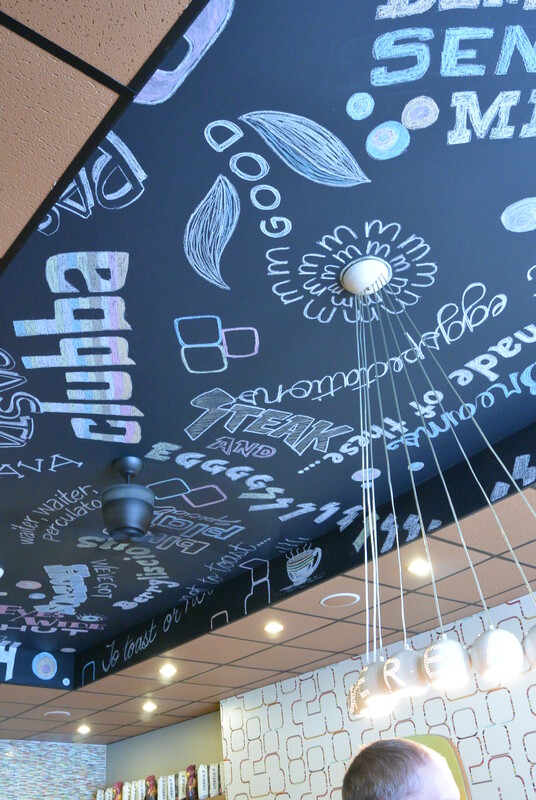 Not to mention all the other things that make a restaurant, like impeccable service and interesting decor. So this was actually our last stop in Calgary. We had planned it so that we’d make it to Sunday Supper, which was recommended by the reviews that tfung had found. Everytime we mentioned Model Milk to someone around the Alberta area, they responded with “My friend went there and they thought it was fantastic!”. 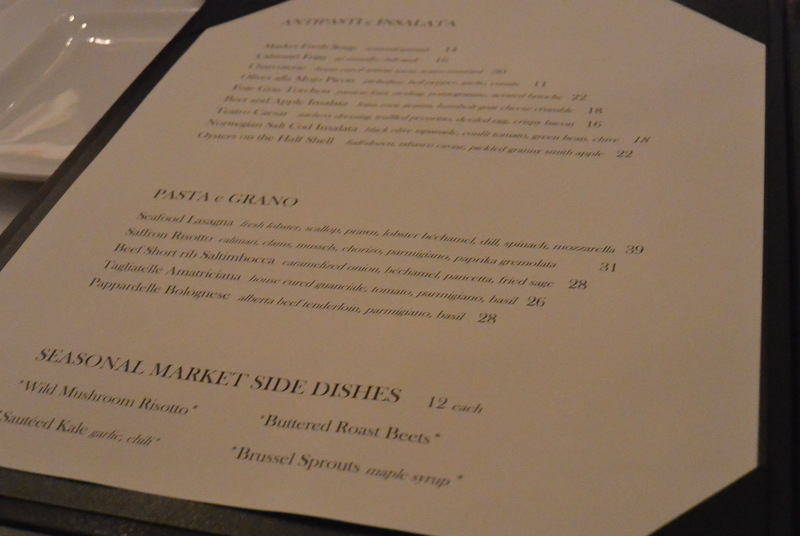 We didn’t really think much of the menu at first because it really didn’t appeal to us. But we were sure glad we took the plunge in the end. He had already made a reservation, which I highly recommend, and the doors really didn’t open until 5:00pm. At 5:00pm sharp, we walked in, and were promptly seated. We were situated in a cozy corner, where we got a good view of the whole place. There were two sort of mezzanines between the bottom and the top floor (which were both for seating). The lower mezzanine was the bulk of the tables, and was where we sat. The higher mezzanine was where the kitchen was. You were able to somewhat see their quick yet controlled bustle around the kitchen to get our orders out. Sunday Supper is a set menu for everyone that night. It changes every week, which is a great marketing idea. 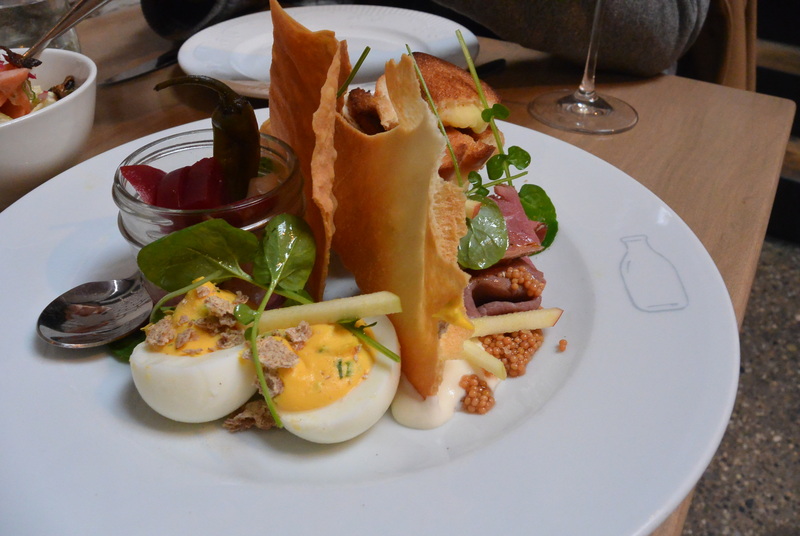 Firstly, a new menu every week is enticing to foodies that reside in Calgary. Secondly, the fixed menu for everyone makes it easy for them to streamline production and serve in a timely and orderly fashion. Thirdly, it allows for a slightly reduced cost due to the purchase in bulk, and the streamlined labour and preparation. Absolutely brilliant. 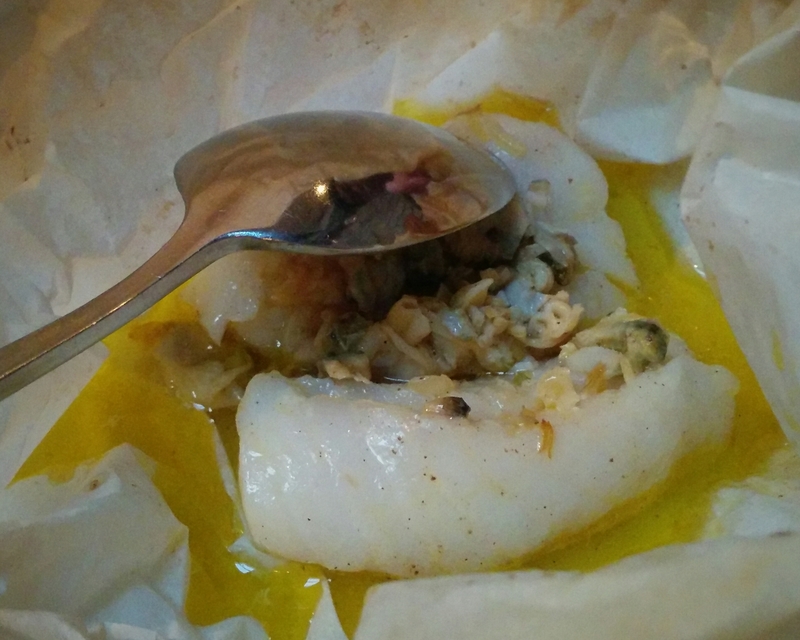 They steamed the cod with clams and butter sauce in a parchment paper package, which we’ve seen once before in a Japanese omakase restaurant. The parchment paper retains the white colour of the fish, and retains the hydration of the fish. Coupled with the flavour of the clams and rich butter sauce, it was quite enjoyable. Unfortunately it was overshadowed in flavour and power by the Swedish meatballs. First off, there were 4 gigantic meatballs on the plate, which we split evenly. The meatballs were delicious. Fully loaded with big flavour. Secondly, though we’re used to the flavour of nappa cabbage, we’ve rarely seen it fermented in such a way leaving a sour, acidic taste (it tastes like kimchi without the spiciness). Thirdly, the garlic mashed potatoes. Holy cow, these were amazing! I have nothing but good things to say about this dish. The meatballs were fat, meaty and juicy. 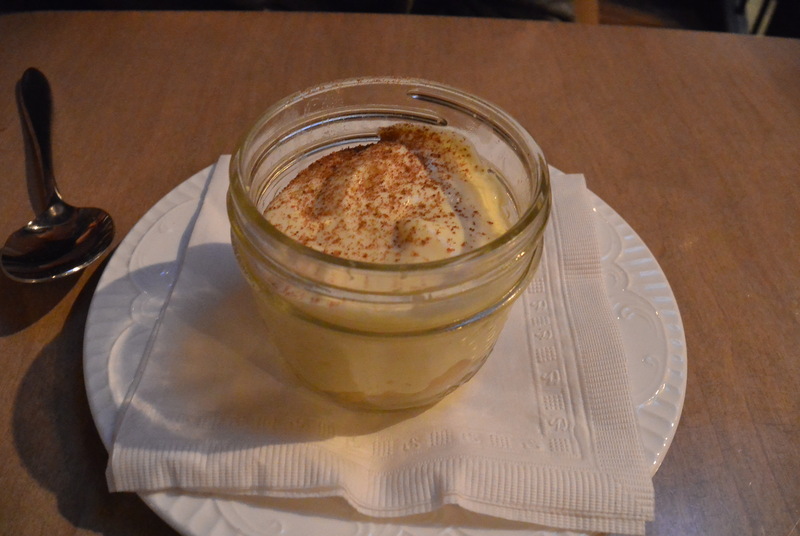 To end the meal, they presented a very simple apple fool in a small mason jar, with cinnamon sprinkled on the top. The apples were baked to a consistency that agreed with me; not too mushy, retaining a slight bite and even crunch to it. The cream part of it was done very smoothly, with a bit of flavour, and paired with the apple, it made for a (seemingly) light dessert to end the meal, without it being too bland. The whole choreography of the meal was absolutely amazing. Some things that would have been labeled as sides did not take a muted presence. 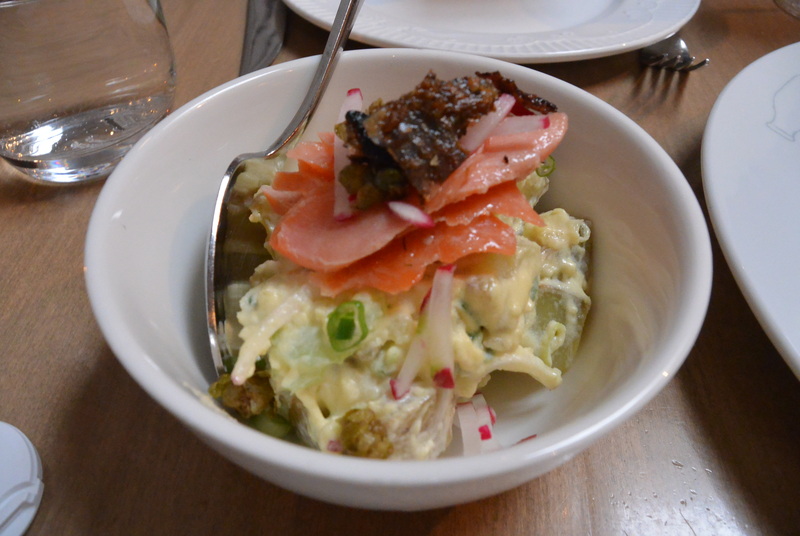 Instead, these “sides” were just as interesting as the “main” ingredient of the dish. I love that every bite was something to be excited about. I truly haven’t been so excited to eat since San Francisco! Although they used a lot of potatoes in the entirety of the meal, it was done in a way where each time we had it, the potatoes were done differently, so that the texture and flavour was not similar. That is the true mark of an excellent meal. It’s all about the contrast in flavour, texture, colour and presentation. 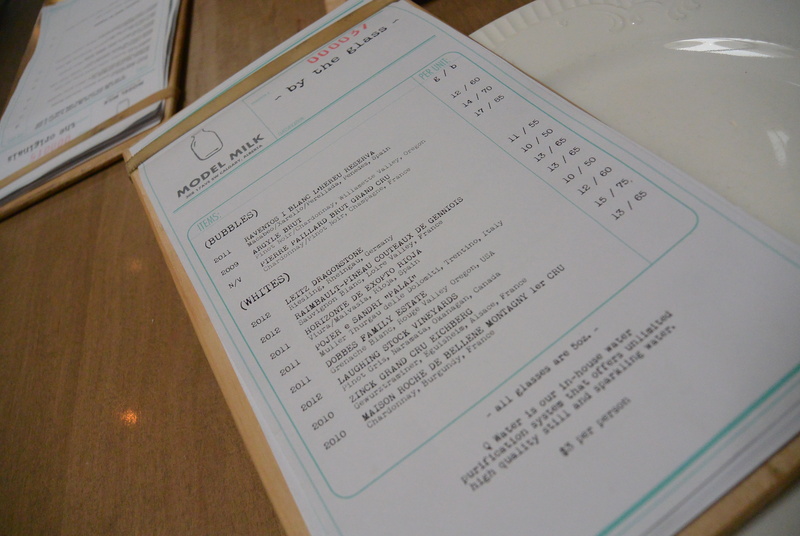 I will not hesitate to make another reservation as soon as I know I am back in Calgary, because Model Milk is PHENOMENAL! To start our second day in Calgary, we decided to go to OEB (Over Easy Breakfast), on tfung’s researched recommendations. We had looked at the menu before, and boy was it extensive! Since I live in Montreal, I wasn’t too excited about the brunch in Calgary. I’ve just had such good experiences in Montreal, and I didn’t want to be too disappointed at OEB. When we got there, the line seemed fairly tame. I estimated that there were about 3-4 groups ahead of us. Was I wrong! They actually take phone numbers, and will call the people on the list by order of when they arrive to put their name down. Both tfung and I thought this was an awful system for such a busy place. They waste 15-20 minutes calling people, and having them drive back over, or perhaps they don’t even show up at all. And that’s exactly what happened. We saw a table that was free and set up, thinking we were likely close to getting seated. We then saw that one of the waitresses who was previously serving get phone duty to call the people who had left their numbers. We were standing near her, so we were able to see that she dialed a total of 4 numbers, all who had said they will not be coming. This took roughly 20 minutes. Then another 10 minutes later, we were seated. It just feels a little unfair to the people who wanted to stay there to wait because we value the food there. Either way, we only waited an hour, which was significantly shorter than the subsequent couples that came just after us (1hour 45min wait). 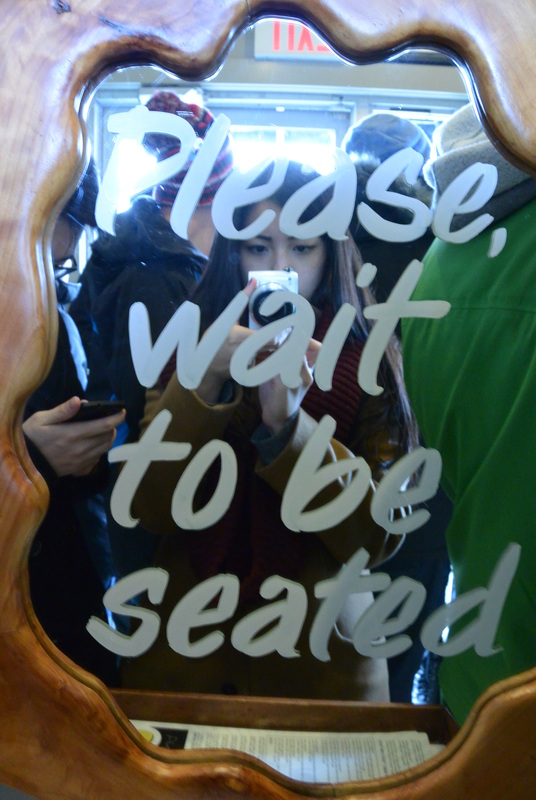 After taking many photos around the restaurant while waiting, we were finally seated. Obviously, I was starving at this point, and felt that I could take on a good amount of food. 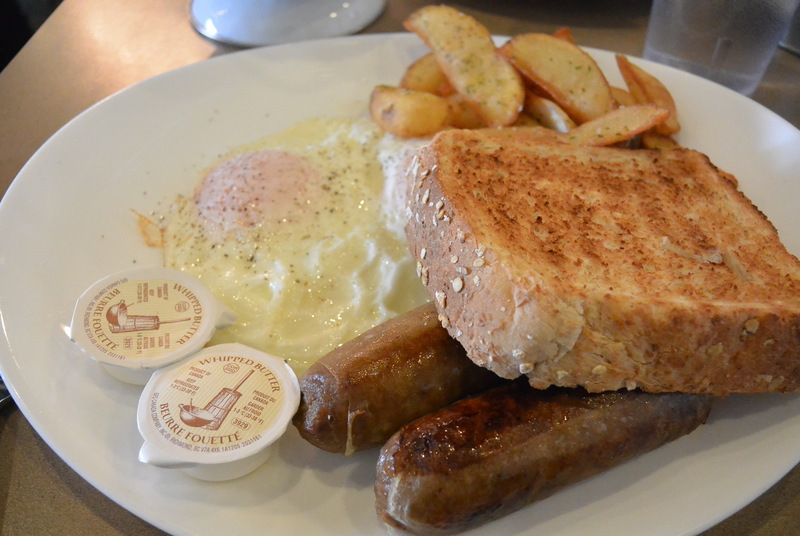 As a result, we ordered the Gold Digga, which is part of the box’d menu, and the 2 cracked hen breakfast with the maple banger. 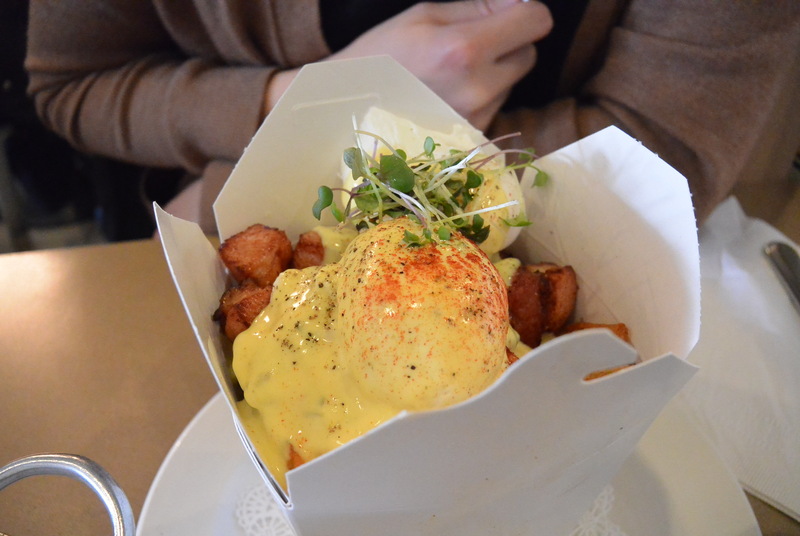 Gold Digga is essentially a Eggs Benedict and poutine mix. It comes with a poached egg, herbed potatoes, cheese curds, pork belly, black truffle and brown butter hollandaise sauce. The egg was quite nice, although I thought that the way they did it left a rubbery texture on the egg whites. The yolk held an orange colour, clearly indicating the fresh feed that the chickens were fed. 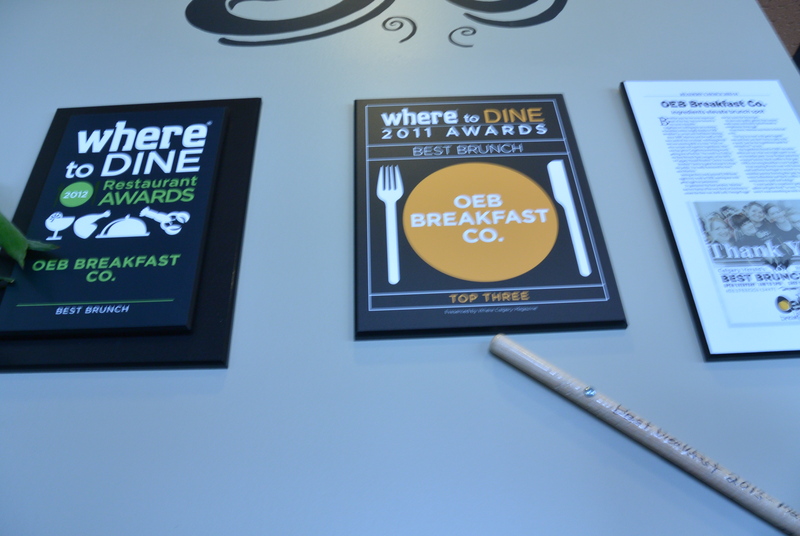 OEB advertises for their eggs coming from their own hens, which is wonderful and fits the farm-to-table category of restaurants. It was clear in the colour and the richness of the yolk that this was true, and that it certainly paid off. The pork belly was a little on the dry side, which might have been better anyway, as the dish itself was already very fatty. As such, it provided a nice meaty buffer to the oily goodness of everything else. The herbed potato wedges in place of fries in the “poutine” made it quite interesting, and less saucy. The black truffle obviously added a richness and classiness that only truffle can add (even when eaten out of a chinese takeout box!). The toast was a little thicker than what I’m normally used to, which may be because you get one piece of toast. I had the honey oat option, and also asked for some jam. I thought that the fried eggs with black pepper on them were absolutely delicious, exactly as I like them. They were not fried to the point where the thin crust is created, but instead, well-oiled so that the egg whites remain white. The yolk was perfectly runny, and again of golden orange colour. The maple bangers were very delicious according to tfung. I’m not a big fan of sausages, so I won’t comment on that. As a whole, this dish is very traditional, which is sometimes exactly what you want. The fact that we had to wait an hour really made the brunch less enjoyable. There was barely any waiting space, so I was constantly smelling someone else’s hair, which was very disgusting. Furthermore, any time you want to speak to any of the waiters/waitresses while waiting, they make you feel like the most annoying person ever. Though I understand it must be stressful to deal with so many people waiting, They really need to calm down and realize that everyone there is quite civilized. No one is trying to weasel their way into jumping the line, and we all just want to be informed. The food overall was quite good and very fresh. The price was a little on the pricey side, because honestly, I can make this if I was given the same ingredients. But either way, it was a fairly enjoyable brunch and I enjoyed the fresh foods, but thought it didn’t quite hit the spot. Perhaps it was the unsatisfactory service. Walking into the restaurant, it looked grand. The ceilings were high with amazing moulding, the pillars were big and there was nicely placed large pieces of art at each of the main walls. The kitchen was open, with copper-coloured steam vents which was even more visually appealing. The bustling sound of people working at the kitchen made us excited to try the food there. The waiter who was serving us promptly came to greet us and asked us about drinks. Soon after, he had came over and due to the fact that tfung had kindly alerted the restaurant previously that it was our 3rd year anniversary together, champagne was brought over to us! The champagne was quite good, not too sweet and not too dry, the bubbles rose quickly, evenly, and in one very straight column. As we looked at the menu, the choice to me was obvious. For appetizer, it was either the calamari or the beet salad for me. We ended up just sharing a calamari appetizer since we were going out for drinks after (and maybe some snacks). 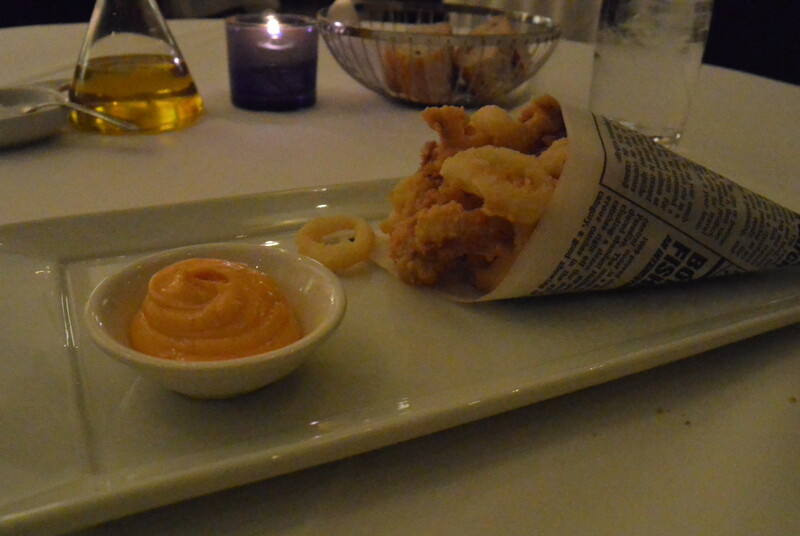 The calamari came in this very cute newspaper cone, with some aioli on the side. The batter was done with rice crumbs, which made it extra crunchy. The calamary was fresh and had that seafood crunch as you bit into it. The aioli could have been a little more flavourful, as in they could have added some sort of extra flavour (garlic, truffle) to it. The one thing I have to complain about was that the calamari was way too salty. It felt like my mouth was burning from the salt. Next time, it’d be better if they had brought the salt down a knotch, and perhaps offered some table salt if the patrons so please. For our mains, I ordered the seafood lasagna, and tfung ordered the Alberta lamb. My seafood lasagna was quite good. It came searing hot, and there was copious amounts of baked cheese and tomato sauce surrounding the lasagna itself. It was topped off with some microgreens, a large scallop and Prawn on the top. The lasagna pasta was quite soft and was to my taste, a little overdone. But due to the fact that it was smothered in sauce, it wasn’t surprising. The ratio of the cheese to pasta to sauce of the lasagna was quite good and to my liking. There was quite a good amount of seafood in it, but you could tell that some of it definitely was not fresh. 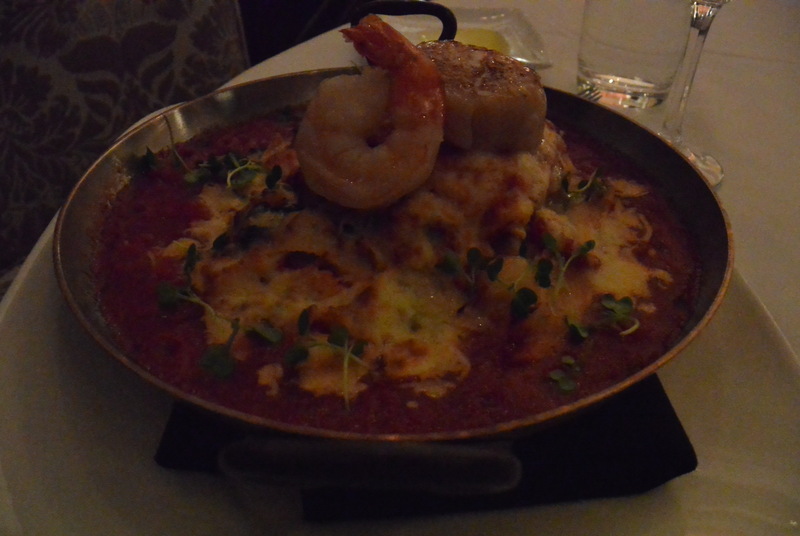 At $39 for this lasagna, I really expected fresh, high quality seafood, which I did not get. The taste was very ordinary and there were no surprises. Thomas’s Alberta lamb was even worse. 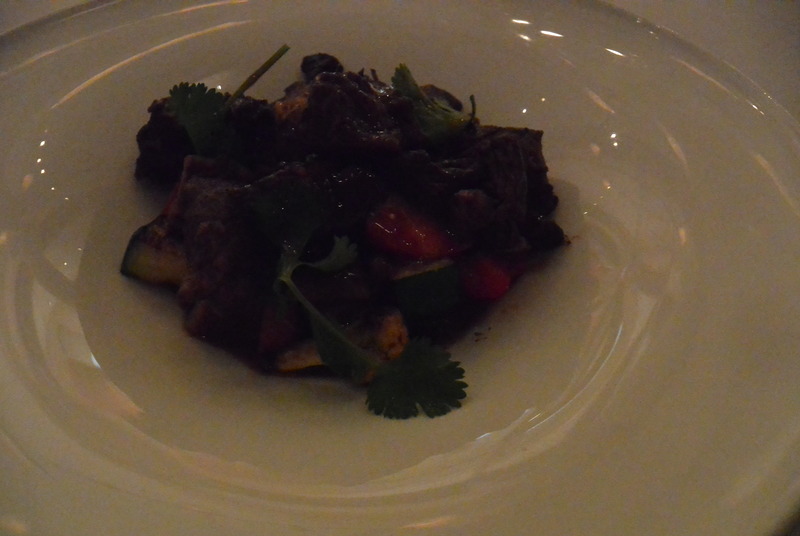 We expected larger pieces of lamb, cooked medium rare, but we got tiny cubes of overdone meat. Furthermore, the whole dish was extremely salty, which meant you cannot taste any flavour of the meat, making us think that this lamb may not be of top quality. Again, at $35, I would not expect this. The vegetables were mixed in, which meant that there was no plating. At a restaurant where they emphasize that they are fine-dining, this lack of plating is absolutely unacceptable. I would not pat $10 for this dish. The evening started off quite well, and ended in disappointment. I felt terrible that for our 3 year anniversary, we didn’t eat amazing food. Oh well, I will not be coming back here ever again. The food doesn’t match up to many of the places we’ve been to and the price is almost triple of what we pay for elsewhere. Although the decor and the service is quite nice, I don’t go to a restaurant solely for that and have the food taste bad. Maybe for a lounge or bar, that would be acceptable (that the drinks are not tasty), but not for a seemingly high quality Italian restaurant.